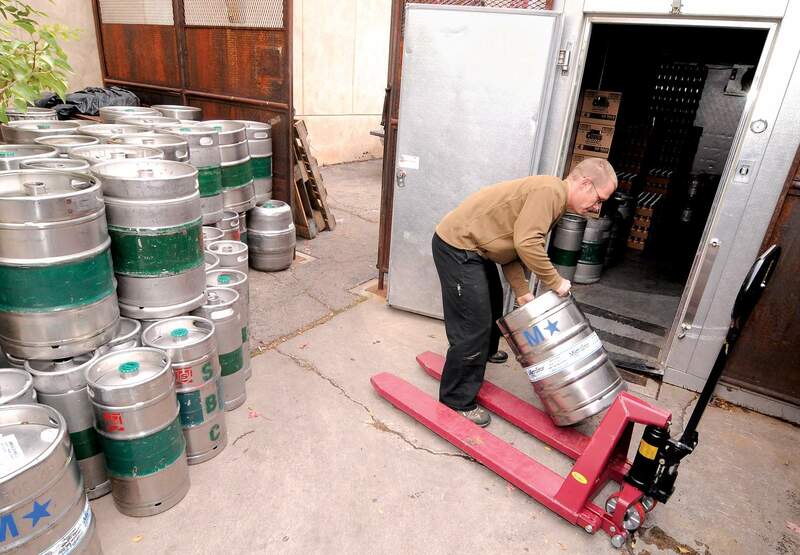 Spencer Roper, a brewer with Steamworks Brewing Co., rolls a keg of Colorado Kolsch into an outdoor cooler. Brewers, vintners, distillers and liquor store owners stood together on Thursday to oppose a proposed ballot initiative that would allow the sale of beer and wine in grocery stores. DENVER – Brewers, distillers, liquor store owners and vintners are not toasting a proposed ballot initiative that would allow the sale of beer and wine in grocery stores. They stood together at a news conference Thursday at Argonaut Wine and Liquor in Denver where the Keep Colorado Local coalition expressed concerns about the initiative led by larger retailers. For years, groups such as the Colorado Retail Council, which represents retailers in Colorado, have been pushing the Legislature to make the change to allow sales in grocery stores. But legislative efforts failed. Proponents, operating as Colorado Consumers for Choice, hope to convince voters to support the effort at the polls. They have not filed ballot language for the initiative that likely would come in 2016. Proponents also have not made any decisions on whether to allow the sale of liquor at supermarkets or if convenience stores would be included, as well. Proponents have launched a website, CoConsumersForChoice.com, where they ask Coloradans to sign a pledge. “Since 1933, we have invented soft-serve ice cream, rock-n-roll, space travel, the Internet and the cellphone, but you still can’t buy real beer or wine in a Colorado grocery store,” the website states. Chris Howes, president of the Colorado Retail Council and spokesman for Colorado Consumers for Choice, said the issue is about presenting options. But opponents cite several concerns. They point out that the craft-brew industry has experienced double-digit growth under the current regulatory model. They also raise fears that the measure would cut business by allowing full-strength alcohol in competitive supermarkets. Larger retailers might choose to stock only larger producers, while smaller breweries and vineyards might not make the cut. They worry that the initiative would put small liquor stores out of business. Kris Oyler, co-founder and owner of Durango-based Steamworks Brewing Co., said he fears the impact to his operation.